The countdown to Vancouver 2010 is on, and today the Olympic Torch made its arrival into my home province of New Brunswick. At 5:07 pm this evening the torch was slated to pass into Dieppe, and a few minutes later travel along the road behind where I live. Realising that the opportunity to see the Olympic torch relay is a rare event, and one that I may never again witness, I decided that I wanted to be a part of this proud tradition. I missed it. I'm such a loser. I probably could have seen it, if I hadn't stopped to go to the bathroom; get the garbage ready to be dropped off along the way, and; at the very last minute decide that a kicky little hat would help hide my unusually unruly mess of hair. But, I'm a special kind of loser. As I headed to the corner where I planned to wait, I noticed a family with small Canada flags walking in the opposite direction, away from where the torch was at any moment going to be passing. I should have taken that as the first clue. Instead I excitedly carried on, and as I got to the corner I noticed that there was seemingly nothing special except for heavier than normal rush-hour traffic. Ever hopeful, I looked up the road... like an idiot. More traffic, more people talking excitedly as they walked away. Dismayed, I turned and look down the road in the direction that the torch would be travelling away from me. There in the distance were the flashing lights of the RCMP cars as they held back the traffic to let the torch pass. 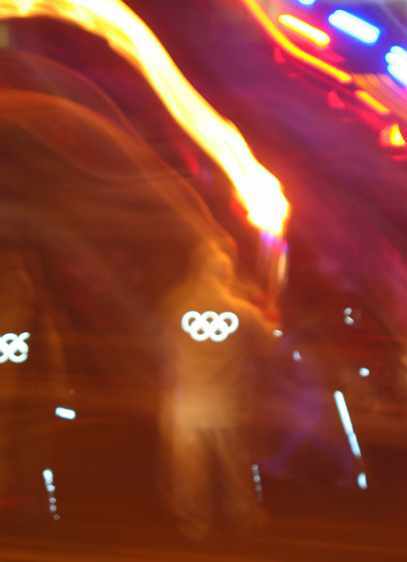 I walked toward the lights, all the while hoping that it was just a traffic accident and that the torch was still behind me. It was not to be. A few blocks ahead, I heard a muffled roar of excitement. The torch was changing hands and carrying on. No! I picked up the pace, and using my briskest walk set forth. I almost caught up. Twice. But like a carrot on a stick, the flame eluded me. After I got held up at a very busy intersection the flame, carrying on its journey, outpaced me. I was not going to be able to catch up. Dejected, I turned back and slowly began walking home passing the excited spectators. Then, I thought "It's not over yet. My Olympic journey will NOT end here!" Racing back home (well, racing is a strong word. I was tired from the first cold kilometre long walk, and used only my second briskest pace on this leg), I burst back into my apartment and looked to see where the flame was headed and where I could try to cut it off at the pass. I could still do it, but I had to be cunning, and quick, and most importantly, I could not get lost! This was going to be interesting as my geography skills are poor at best and the torch route sort of backtracked on itself at a strange angle. I ran back outside (stopping first to check my mail, having not already learned my lesson!) and jumped into the Matrix (Toyota, not Keanu!). I gunned the engine and roared away at a reasonable and safe speed. I was again on my way. Then the gas light came on. Seriously? I turned up the road that I thought the flame might now be on. No flashing lights, no excited spectators. Nothing but cold, dark street. I traveled up a little further. Still nothing. I went on a little further and in my peripheral vision I caught the quickest flash of blue light. I did a couple of quick around the block moves and found the lights again a few blocks away. I made it. And this time I had not missed it. I had to wait a few minutes for the torch to arrive, but arrive it did. I witnessed history unfold. And this my friends, is an example of the indomitable spirit on which Olympic dreams are built. Now, you'll have to take my word for it that this is in fact, a photo of the Olympic Torch.